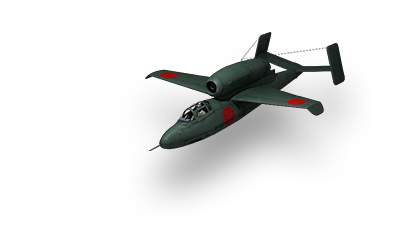 Project for a high-speed well-armed fighter developed by the Tachikawa Aircraft Company in 1943–1945. By the end of World War II only prototypes were built that never took to the air. The second Ki-94 design, made by a team under Tatsuo Hasegawa, chief designer of the aircraft and responsible for the used airfoil, was a more conventional single-seat, piston-engine monoplane fighter, developed for the Imperial Japanese Army Air Force along the same requirements as the Nakajima Ki-87, which had been the Army's fall-back design for the original Ki-94. Intended to counter B-29 raids, it was optimized for high-altitude interception with a pressurized cockpit and heavy armament. This design was approved by the Koku Hombu, and the aircraft was designated Ki-94-II (the scrapped earlier Ki-94 design was named the Ki-94-I). An order was placed for one static test airframe, three prototypes, and eighteen pre-production aircraft. Only 2 prototypes were built in the event; the first was equipped with a single 1,895 kW (2,541 hp) Nakajima Ha219 [Ha-44] engine, driving a 4-blade propeller because the 6-blade one was not ready. The second prototype was to be fitted with a 6-blade propeller. The war's end however stopped the construction of the second prototype and also found the first prototype still being readied for its maiden flight, the Ki-94-II never taking to the air. The first prototype of the Ki-94-II under construction. This page was last modified on 30 September 2016, at 00:41.